It might be their first final since 2006, but Eglinton will be missing two key players as wedding bells will be ringing just around the same time as the game gets underway on Friday. 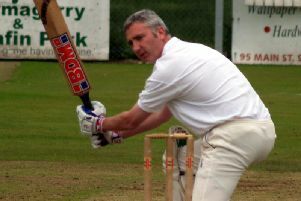 The Villagers will be without brothers Craig and Mark Averill, as the opening batsman is best man for his brother’s wedding, however skipper Christopher Pierce believes they still have a selection headache. “Craig and Mark missing is a blow, but we still have a bit of a dilemma,” admitted the captain. “I suppose it’s a great dilemma as we have four or five players fighting for a couple of places, so it will be a tough selection to pick those couple of players. Donemana captain Richard Kee knows no matter what team his side come up against they are going to have two tough days, but he can’t wait to play at one of his favourites grounds. “Eglinton are a really good side and they have three or four really dangerous players, but not just the main players like Oraine Williams or Stuart Thompson, they have a lot of capable players who can take the game away from us. “They have other guys who can come in, who are really good cricketers and it showed over the last couple of weeks with their performances. “Even against us we just about got over the line against them in the league matches, but they are right in form, so we know it is going to be tough. Meanwhile all the action gets underway at 12noon on both Friday and Saturday, with admission £5 or £15, which will include a buffet on Friday and the umpires will be Charlie McElwee and Graham McCrea.